The "Aqui y Alla" is a transnational public art project created and directed by local artist Michelle Angela Ortiz. The project explores the impact of immigration in the lives of Mexican immigrant youth in South Philadelphia in connection with youth in Chihuahua, Mexico. 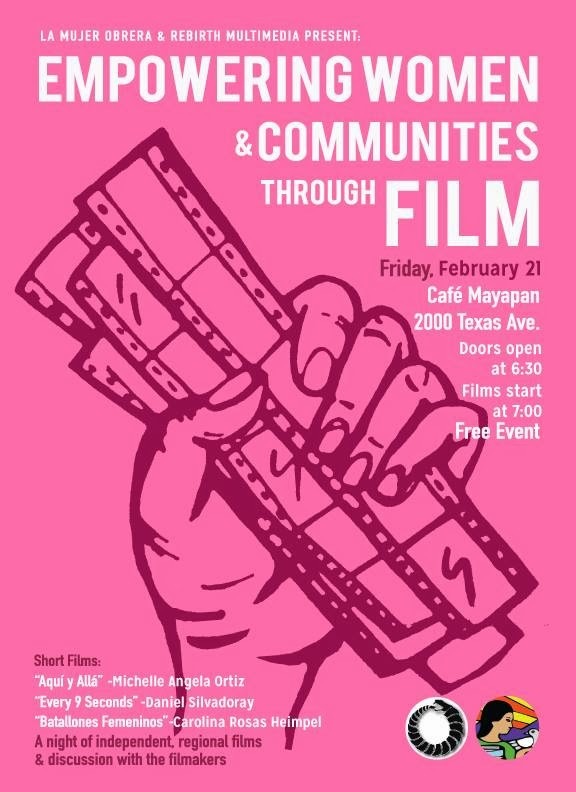 The “Aquí y Allá” Mural Documentary will featured at the “Empowering Women & Communities Through Film” on Friday, February 21st, 2014 at 6:30 pm at Café Mayapan, 2000 Texas Avenue, El Paso, Texas. This free event will be hosted by La Mujer Obrera and Rebirth Multimedia. El Museo de Arte de Cuidad Juàrez (Museum of Art in Juarez, Mexico) and Espacios Comunes will be presenting the “Aquí y Allá” Mural Documentary in their short documentary series. Espacios Comunes (Common Spaces) is an exhibition that showcases the work of a new generation of artists in Ciudad Juarez, Mexico. Espacios Comunes highlights collaborative, socially engaged work that supports community revitalization through various artistic disciplines: media, street art, installation, music and literature. Check out the Upcoming Events!!! La Casa Latina and Penn for Immigrant Rights will be having a documentary screening of the "Aqui y Alla" Documentary. After the screening, a panel discussion will be held with lead artist Michelle Angela Ortiz, Erika Almiron (the director of Juntos), and Amada Armenta (Assistant Professor of Sociology) about the project and the impact of immigration policies on youth. To join the event click here. Lead artist, Michelle Angela Ortiz, will be presenting the "Aqui y Alla" Documentary at the International Policy Conference at Millersville University. This two-day event on September 26- 27 will feature inspiring speakers from many dimensions of human rights. For more info click here. The "Aqui y Alla" Documentary will be shown during the series of events from the PASSAGES exhibition presented by Visiones Culturales, LLC. For more info click here. 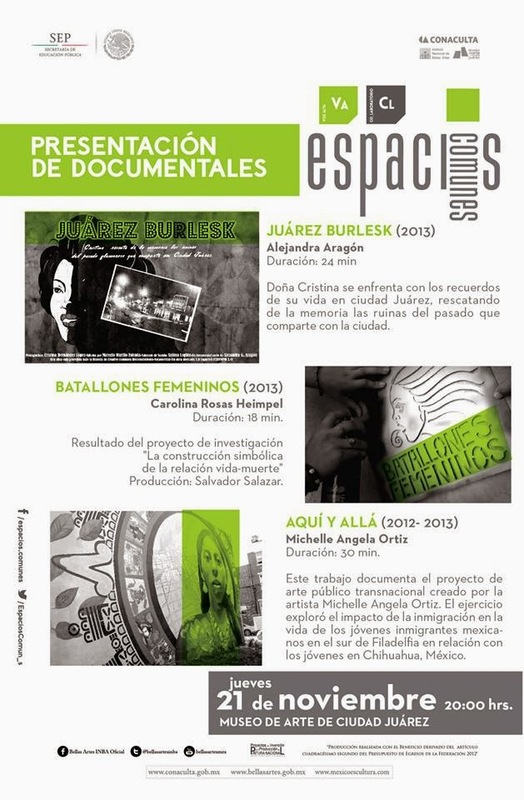 Lead Artist, Michelle Angela Ortiz, traveled to El Paso, Texas and Juarez, Mexico to present the "Aquí y Allá" Documentary as part of the Del Corazon Film Festival. During her visit, Ortiz also spoke to young community leaders from La Fundación Comunitaria de la Frontera Norte, A.C., a nonprofit organization developing youth leaders in Ciudad Juarez and channeling philanthropic resources to the community. Here are some highlights from the screening at the festival. Celebrating its 16th year, Scribe Video Center’s Street Movies! is now a citywide, summer tradition that brings neighbors together to enjoy entertaining and thought-provoking independent films outdoors. Street Movies! uses short films as a springboard to get community members talking about the issues that are important to them. As part of Street Movies!, the "Aquí y Allá" Mural Documentary will be presented by artist Michelle Angela Ortiz with community partners Juntos and One Love Movement. The series of films will explore issues of immigration and present powerful stories through short films. The event is FREE, Open to the Public, and Family-Friendly! Bring lawn chairs and blankets. In case of rain, this event will be held on Saturday August 17. The event will be hosted by Michelle Angela Ortiz, artist, filmmaker, and creator of the “Aquí y Allá” mural, a transnational project between youth in the US and Mexico. The mural will provide a beautiful backdrop for this outdoor event. Street Movies! is presented in part by PECO and by a grant through the Philadelphia Redevelopment Authority’s Fund for Art and Civic Engagement (FACE). Check out the upcoming "Aquí y Allá" Mural Documentary screenings this summer! My documentary will be shown in Scribe's Storyville monthly screening series dedicated to showcasing contemporary documentaries produced by Philadelphia based independent film and video makers. For more information click here. Presented by the Galleries at Moore, my documentary will be part of the Film al Fresco juried competition and outdoor summer film series that showcases the work of independent filmmakers from the Greater Philadelphia region. For more information click here. 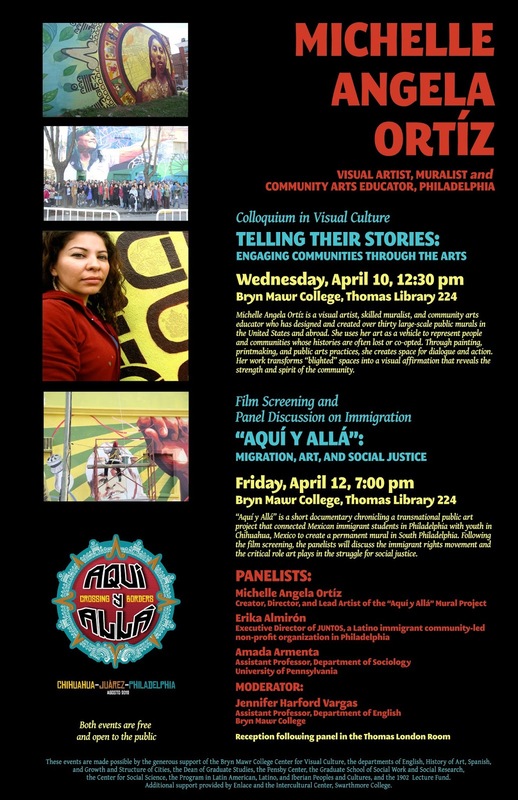 Michelle Angela Ortiz, Lead Artist and Director of the "Aquí y Allá" project, will be giving to talks at Bryn Mawr College. Both events are free and open to the public. For directions click here. Aqui y Alla on Facebook!